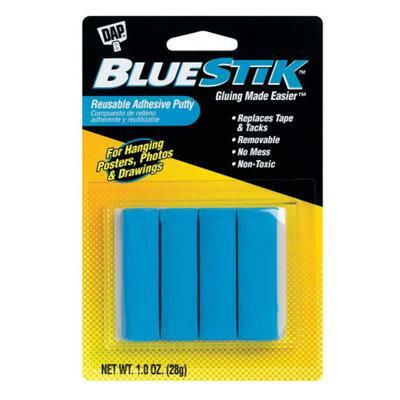 DAP Blue Stik is a reusable, removable adhesive putty that replaces tape, tacks, staples and magnets. It is ideal for a wide variety of uses in the home, school and office. It can be used time and time again and wont dry out. No more chipped, peeled paint or holes in the walls. This convenient, ready-to-use putty bonds just about anything to slick or hard surfaces, such as wood, tile, glass, concrete, porcelain, Formica, metal and painted surfaces. Use to fasten decorations, posters, notes and paintings. Also helps protect items from vibration damage. Blue Stik can be used time and time again. Conforms to ASTM D 4236.